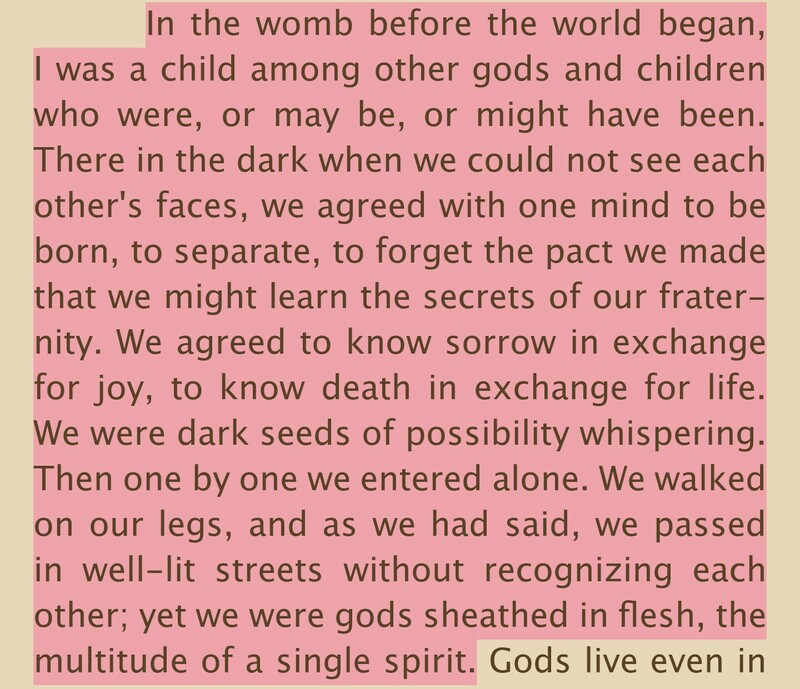 From Normandi Ellis’s Awakening Osiris (the book of the dead). The principle of mentalism says that the all is mind. Therefore, our individual consciousness is a fragment of the consciousness of God. I am a divine being, but I am well aware that I have limited myself so as to experience myself, as have all my fellow creatures. Oneness sounds great, until you remember that in the beginning, God was one, and God was alone. This is why we are here. Our consciousness is God’s consciousness, limited, fragmented, but potentially can be made whole, though not by any one individual, and certainly not in one lifetime. This is why words are holy. Why stories and myths and poetry and even, gasp, modern cinema and tv and music are holy. They are the words of Gods. Fragmented, they are incomplete and short sighted. But joined, they paint a vast, clear, incomprehensible picture. We who are aware of ourselves as Gods, are as Aset (Isis) gathering the fragments of Asar (Osiris) that Set (Seth) has cut apart. Tehuti (Thoth) is ever our guide in the form of words and expression. We seek truth and beauty in the works of the human mind and nature. We weave the common threads together to fill the holes in our own tapestry of truth, the art of the spirit. We find the threads that are less common, harder to articulate, spoken only by hidden prophets, common people who aren’t so common. And we have our own revelations. Incarnation separates us, encasing us in a “flesh prison,” but the art of story gives us glimpses past our walls. We, as witches, commonly have a thirst for knowledge that is unquenchable, and this is why. The all is mind, thus thought and knowledge is the path to God. We seek truth from many Gods, many books, many practices, and many stories, ancient and new. The myths survive, and they always will, though their forms will surely change. I see it in so many places, the seeds being sown for a new generation of seekers. Interest being revived in the magical, in nature, in the old Gods (who were once new Gods), in our own potential, good and evil. I quoted American Gods at the top of my blog because the idea of the Gods being created by our belief both resonated with me and disturbed me. I did not want to believe that the Gods needed us in order to exist. It seemed demeaning. But now I understand, and I think it was an important lesson for me. The Gods are indeed what we make of them. Without us, they exist still, but as one, all but alone. With us, they experience love and grief, fear and survival, pleasure and guilt, truth and lies. They become so beautifully multifaceted in our lives and minds, both our creators and our created. This I seek to remember in my craft. As I write I seek to share ideas, hoping to help fill someone’s holes. As I read I seek to fill my own spaces. As I see a fantastic explanation of the chakras in a children’s show, or see yet another creation myth played out in a movie, I gain hope for tomorrow. And as I worship, I remember. The Gods are what we make of them, so I’d better make them Great. I wish to do all of my workings and devotions in the spirit of perfect love and perfect trust. And, on a day when Doubt crept up in the back of my mind and whispered, Anpu answered. He told me, you are perfectly imperfect. You will always have some small amount of doubt, as you are beautifully human. You were lovingly crafted just as you are. Can darkness remain even with the smallest light shining upon it? No. That’s all you need then, to overcome darkness, the smallest of lights. And to overcome doubt? The smallest bit of belief, and you, my friend, have more than that. No worries, then. Perfect trust you have, and perfect love too. It brought to mind the image of yin and yang. There is white in the black side and black in the white side. Perfectly imperfect. Thanks, Anpu. Anpu and my ancestors got offerings of whisky, shisha, incense, and rose oil, with love, as I petitioned for my health, strength, and energy. Nature was kind enough to gift me yesterday with a gardenia blossom for love and purity, and crepe myrtle bark for strength, change, and union. They called to me to offer their aid, and I am grateful. I have the privilege of training in two lovely traditions of witchcraft. That, along with my interests in hoodoo ways of working and my native American ancestry, flavors and empowers my personal, eclectic path. That path has been in flux for a very long time, as I’ve transitioned from eclectic wicca to Isian and Wica. It’s taken a little while for me to figure out where to go from this point in my life, where so many of the old beliefs are being torn down, and so many of the new are settling in. But I’m beginning to see the places that always felt like home to me and still do, truths always felt and now validated, reaffirmed. I’m beginning to believe that I really can learn all the astrology and subtle nuances of the tarot that I always felt were too big for me before. And I’m beginning to feel the currents of my traditions empowering even my personal work, opening more for me every time I draw from them. It’s hard to find traditional training, but I really feel like if you work for it and make it a goal, it will find you. 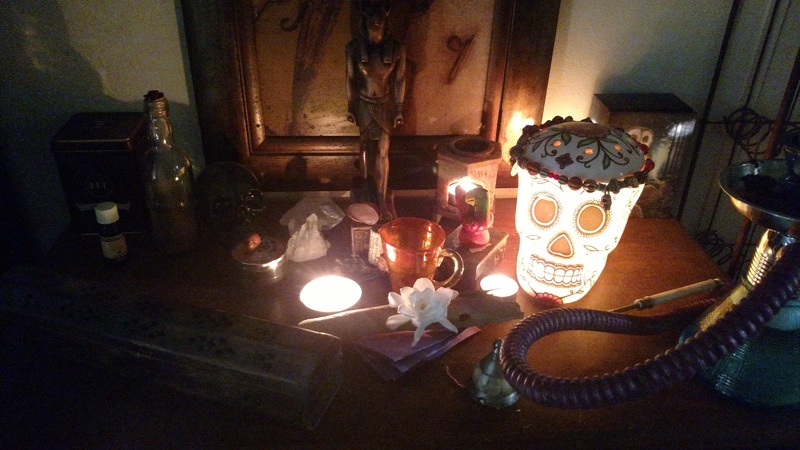 I practiced eclectic book Wicca for 14 years before I found traditional training. I accomplished and learned a lot during that time. I also had this strong pull meanwhile, always nagging at me, to find a teacher. I got discouraged at times and told myself it was something I could do without, that my practice was just as good without it. But it wasn’t, which isn’t to say that would be true for anyone else at all. I only claim to know myself. We simply must follow our desires, and if there truly is a call, I think a way will be made and eventually, one was made for me. I’m so grateful for the mysteries as they unfold, though I have barely scratched the surface.